North Carolina in the middle of the summer can be brutal. Heat and humidity blankets the Triangle, making us all search for a cool, indoor space to pass the time. Unfortunately, we do have to venture out, even when the temperature reaches its peak. Extreme heat is an enemy of all cars — and an enemy of people, should we go to crank the car only to find the A/C blowing but a breath of cool air. Don’t sweat! Contact TransMedics: Raleigh, NC’s premier source for auto air conditioning service and repair. Our mechanics will work hard to diagnose your issue and work quickly to find a solution, making your ride comfortable again. Like your car’s engine and transmission, its air conditioning system has parts and pieces that occasionally need attention. This can come in the form of preventative maintenance or, in the event of a breakdown, repair. Compressor – Your vehicle’s compressor compacts and compresses refrigerant (which converts liquid to gas) and pushes it to the condenser. If you are hearing strange sounds, it could be a sign the compressor is bad. Condenser – Condensers are heat exchangers that releases heat from the refrigerant. The condenser can get debris trapped inside, such as leaves and bugs, which can cause poor performance. For all your Raleigh car air conditioning repair and service needs, reach out to the trained and experienced mechanics at TransMedics on Old Wake Forest Road. Our team can lend a helping hand to any auto A/C in need! 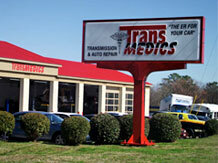 TransMedics’ customers travel from all over the Triangle to visit our auto shop. We see customers from Raleigh, Wake Forest, Rolesville, Knightdale, Durham, Cary and all surrounding areas.